Ruth ByCycle is not a little girl to sit around and wait for things to happen to her. Oh no. Since she could first talk and walk, she has made things happen. Some of the things have been very successful, others, not so much. She learned to open doors, and baby gates because she wanted to get out to have a crack at more exciting things she could see on the other side. She cut her own hair, because frankly Mummy was taking far too long about arranging a hair appointment. 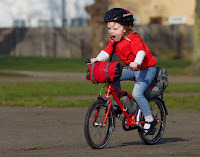 She helped herself to her brother’s bike packing bags and tried to fit them to her frame when it seemed that Mummy and Daddy had failed to realise that 3 year olds need bike packing kit. So it should have come as no surprise that when Ruth, now 4, decided she wanted to enter a race on her bike, Ruth was going to enter a race on her bike. Or rather, on her brother’s bike. 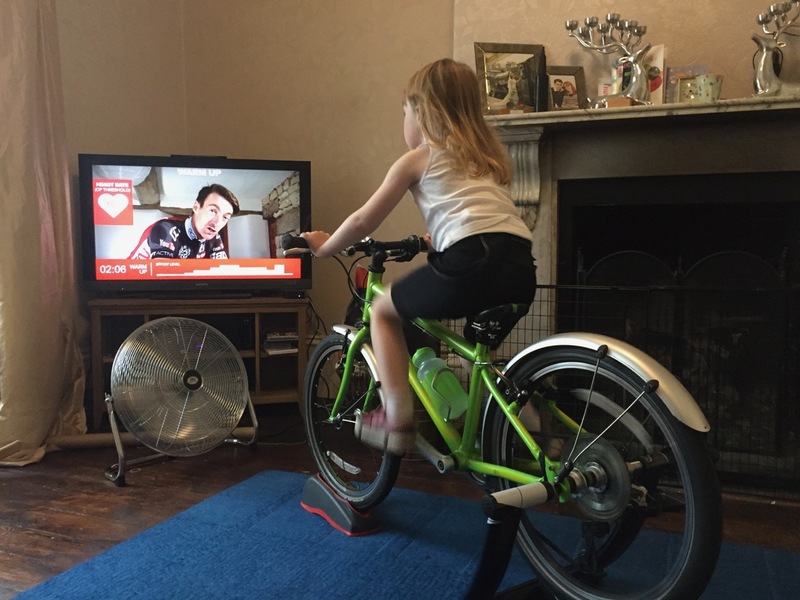 Ruth had decided that she was going to need something more competitive than her 16” wheels, so 'Merida' was consigned to the cupboard and Ruth pestered Daddy until he conceded that she could have a go on the semi-retired 20” Islabikes Beinn, which, she pointed out, she could test ride on the turbo trainer. 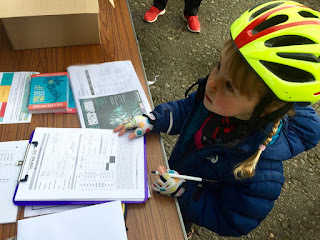 The reach was a bit more of a stretch than ideal, but having taken it for a spin around our usual training ground, the nearby “Secret Squirrel Velodrome”, Tom was happy enough that she wasn’t going to do herself a mischief. Training with Dan Lloyd. Like a boss. So it was that we found ourselves headed for the Milton Keynes Bowl on the cold but sunny morning of 30 September. Until this morning, I associated “the Bowl” with concerts - not bike racing. 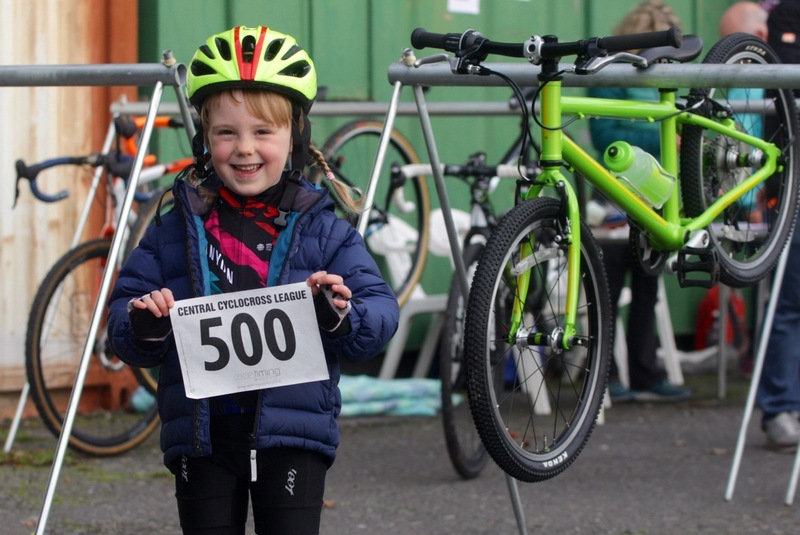 We arrive in the car park (such is our eagerness that we are uncharacteristically early) and get Beinn the bike out, and some extra layers to keep Ruth warm while we wait for the race to start. Kit is very important to our little people. 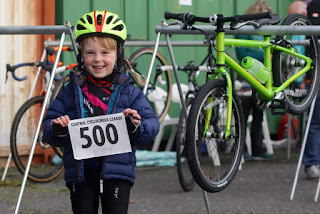 They want to feel part of things, so Ruth was already fully kitted out in her mini Canyon-SRAM jersey, her tri shorts and leg warmers (again, shamelessly pinched from big brother @Thomas_Ivor) and had been since she arrived in our bedroom at 6am declaring herself “ready”. 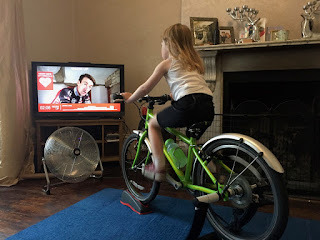 Rhoda, likewise, absolutely required full cycling kit for her role as her big sister’s chief cheerleader, but equally absolutely shunned the idea of wearing anything to cover her legs, so it was shorts for her. “Mummy, I need my Laura Trott plaits”. 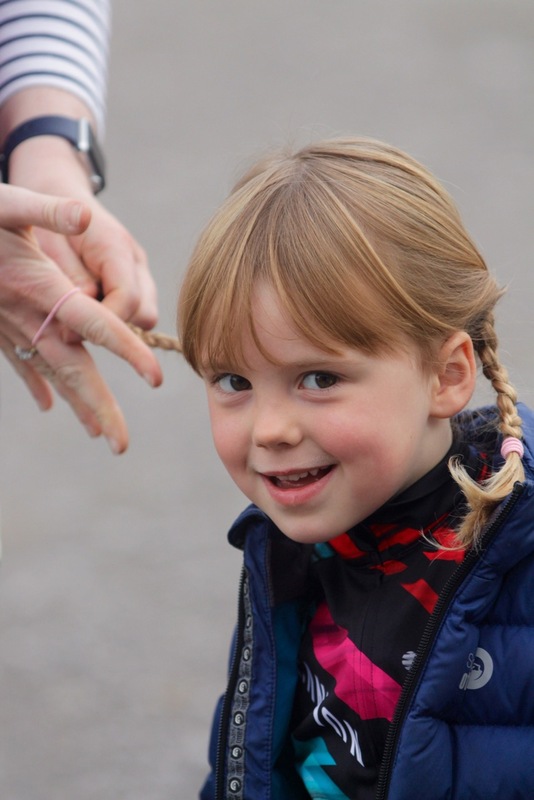 I dutifully braid Ruth’s hair to her satisfaction - if it’s good enough for an Olympian, Ruth thinks it will probably do for her first race. “I need plaits too”. 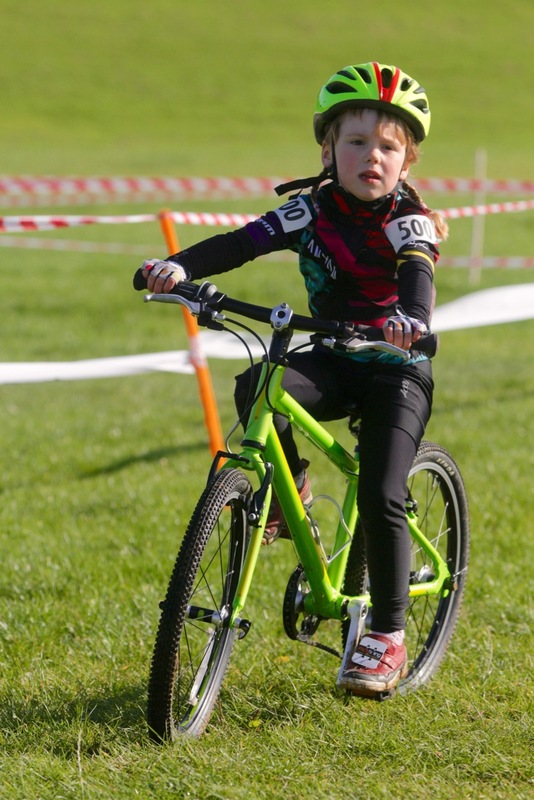 Rhoda likewise, is soon sporting her own tribute to the mighty Laura Trott - if you need proof of what the influence of successful women on little girls can be, look no further than these two! We were ready: time to sign on. We walked through to the bowl from the car park. 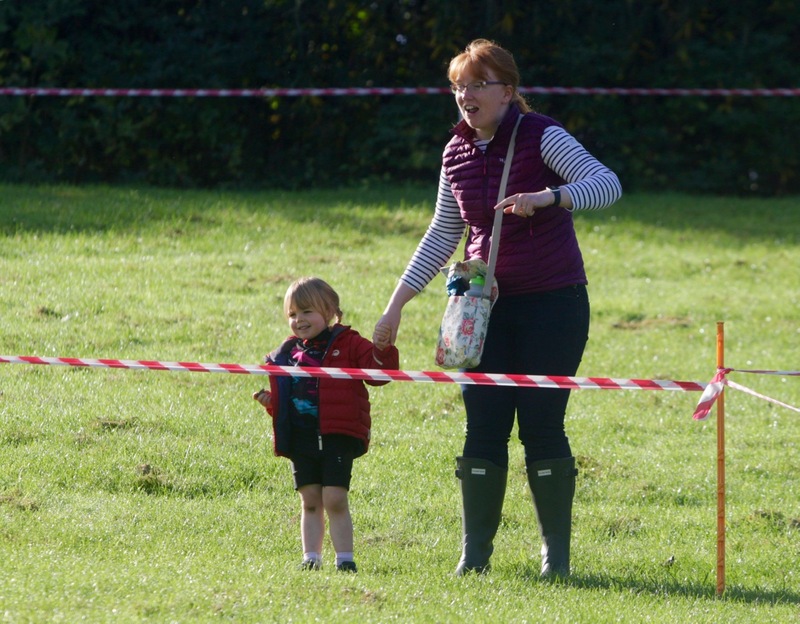 As well as being Ruth’s first cyclocross race, it was also Mummy’s first time at a cyclocross race. 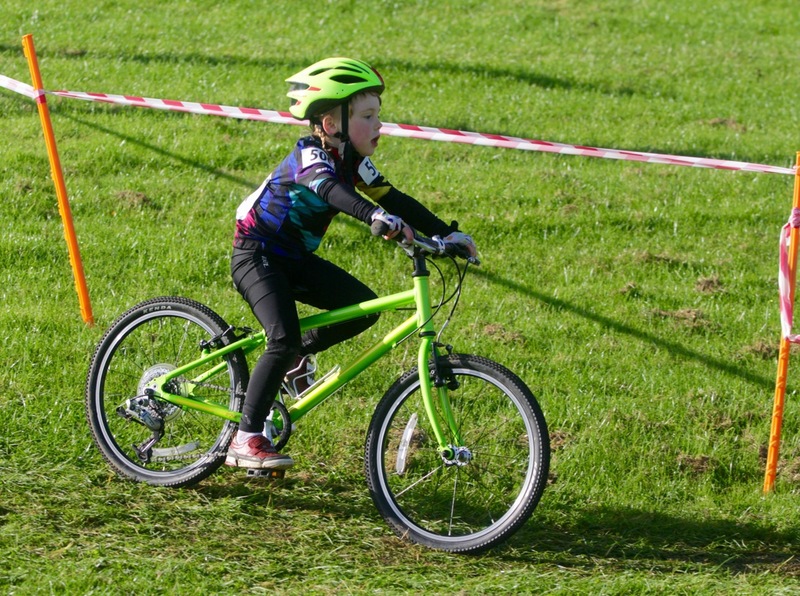 It is probably time for a confession: I am not sure I really understand the point of cyclocross racing. It appears to me that a group of fully grown adults, and a smaller number of children, take their bikes to chase around a churned up patch of grass over which they ride lap after identical lap and then go home in a muddy mess having gone, well, nowhere. However, I am not one to stand in the way of a dream, so I donned my wellies and kept my counsel. Arriving at the gates, I look around and take in the Bowl, filled with what looks like several hundred miles of plastic tape marking out a course that traverses and climbs the sides and bottom of the bowl, disappearing off into trees. I try to work out where you get into the taped labyrinth for practice. I can see the start/finish line, but struggle to work out much more than that. 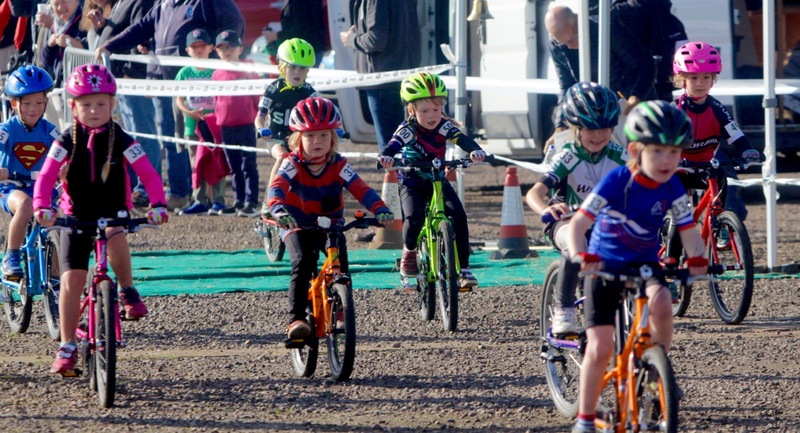 Clearly the under 8s weren’t going to tackle the whole course (not unless we wanted the race to last an entire week), but which bit would they race over? The flat bit at the bottom? How was four year old Ruth going to fare with navigating her way around this? Good job we came early for a look at the course, I thought. But first things first: a very proud Ruth, grinning ear to ear, was hanging Beinn on the bike stand (which it is barely big enough for) by the registration desk and was soon clutching her very first set of race numbers, and a timing chip (which looked rather large) for her (implausibly small) shoes. 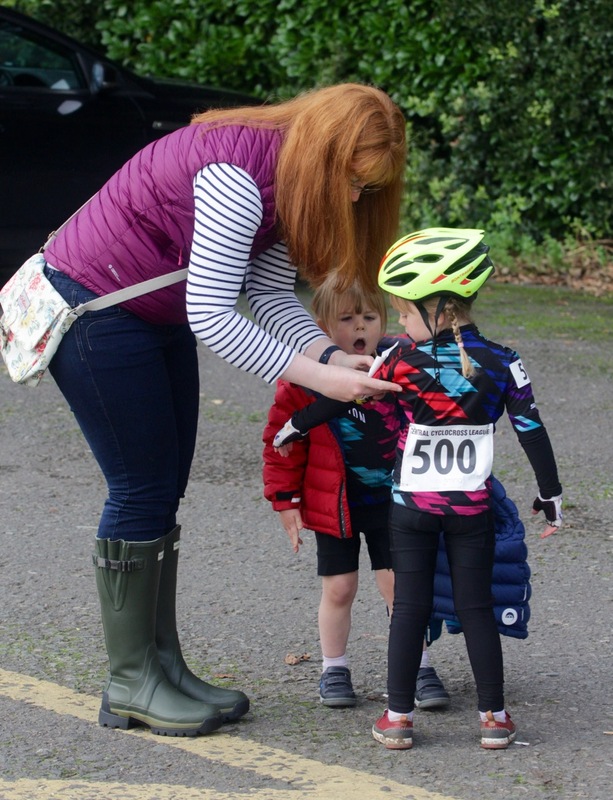 We pin and stick the race numbers to her jersey and look around to see where to get into the course to give Ruth a proper look at where she would be going. Tom set off with her to walk along the course with her. 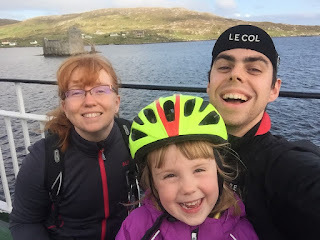 This was no flat course, and Ruth was soon having to work out that she needed to get off and push her bike up the sloped side of the bowl, before getting back on to roll down again. This all took quite a long time, and she lost confidence as other kids warming up zipped up and down past her. 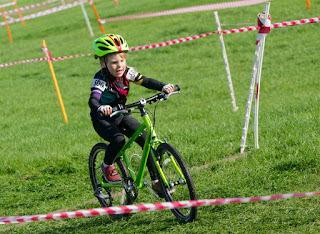 Urged on by her friend Jake (racing in the U10s) and Daddy, she was soon back with us in the start area to be marshalled. The body warmer came off. The drinks bottle found its way to Mummy’s handbag (where all discarded items belonging to the children seem to end up, no matter what I do) in the name of "weight saving", and she was ready. Rhoda and Mummy begin whooping and hollering: “Go Ruth! Whooooo!”. Mummy realises that she might be the only grown up cheering. What is wrong with everyone? Why is no one else cheering? Wait, no, there is someone else shouting. That would be Daddy. 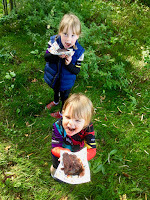 We are potentially committing a cycle parent faux pas - I have no idea. Maybe people don’t cheer? They definitely cheer at road races. Does cyclocross have different rules? “GO RUTH!” Rhoda joins in. She heaves. The grass is wet and she struggles for grip. She sobs, but she doesn’t stop. The first child laps her. She stops while they pass her but then she is moving again. We are still the only parents cheering. People are looking. And frankly my dear, I don’t give a damn. That’s my girl, and I’m going to make ALL the noise for her. She crests the hill, briefly triumphant. Rhoda and I are jubilant and immediately make a lot more noise. Tom (down the bottom) is louder still. Now, get back on the bike, Ruth, I think. She is still walking. She turns and looks doubtfully at the slope back down, now churned by the wheels of the previous 30 odd kids to pass over it (twice by now). She stops and looks some more. “Get on your bike, Ruth”, I venture. 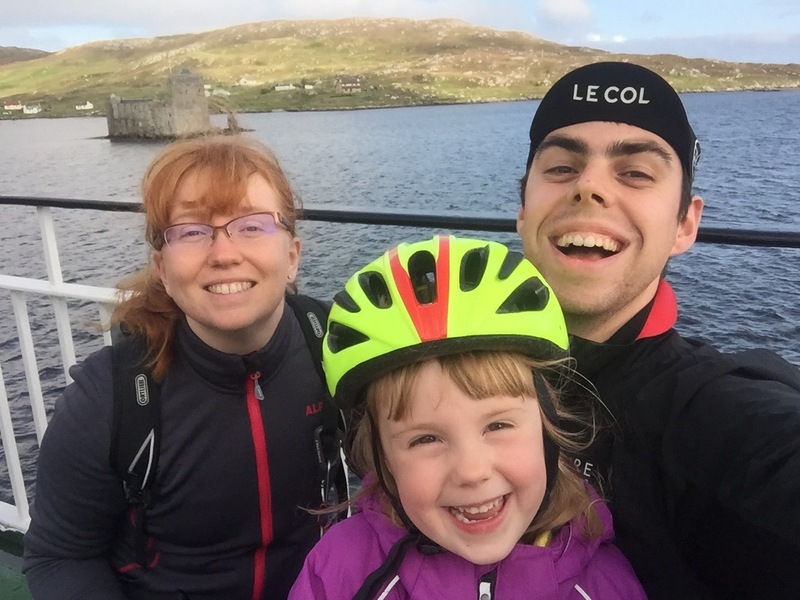 “Ride the bike, Ruth”, I hear Tom shouting from some considerable distance away, and briefly register what a ludicrous thing to shout this must sound to anyone else who came here to watch a bike race. Ruth has rolled down slopes like this hundreds of times, but in this moment she has misplaced the confidence to do it. She scrambles down slowly on foot until she is back on the level. She is still running with the bike. “GET ON YOUR BIKE, Ruth!” She looks at me. Tear stained. Muddy. I want to go and grab her and hug her and take her home. “You can do it Ruth -just get on your bike!” She looks daggers at me, briefly, but then climbs on and pedals away from me. She expects to see a flag at the finish (and so do I - she has taken over 9 minutes at this point). There is no flag. So she..... sets off for a second lap. Just like that, no fuss. She’s just as intent as she was for the first lap, as the entire field begins to lap her again. I can see Tom jogging along with her. She is making good progress along the bottom of the bowl, and then, they are back at the slope again. She gets off, she grits her teeth. She wails, she cries, she shouts, she growls, but she does it. Herself. She is up. Other parents look at us like we are a) insane and b) possibly torturing our daughter, who is by now so far behind the field that it is starting to look like she isn’t even in the same race. She rounds the corner and again refuses to ride down the slope, and slip-slithers her way back down. The determination face is there again at the bottom. She is going to finish this. Rhoda and I hare back down to the finish area, waiting for the marshals to allow us to cross the course to get back. Ruth is there, muddy, beaming ear to ear. She came in last, and probably about a minute after the rest of the race finished, one lap down on most of the other participants, but she did it. 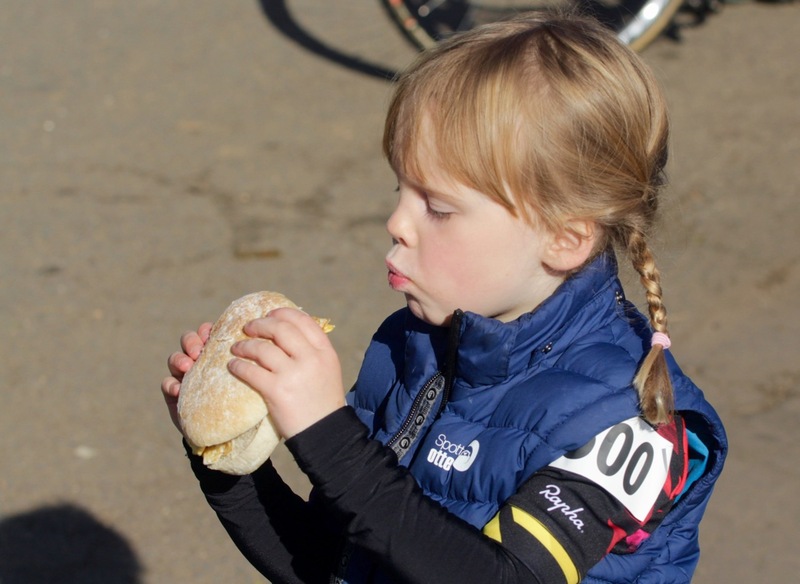 I ask her what she might like as a treat for completing her first race. She wants to watch the podium. She doesn’t say it, but I watch her as her friend Jake collects a medal and I can see on her face that she knows that one day that will be her on the podium. Medals awarded, Ruth is back to business. “Mummy, I have thought of what I would like. An egg sandwich. And when we do this next week, I would like to win”. "Next week?" What? We have to do this again? 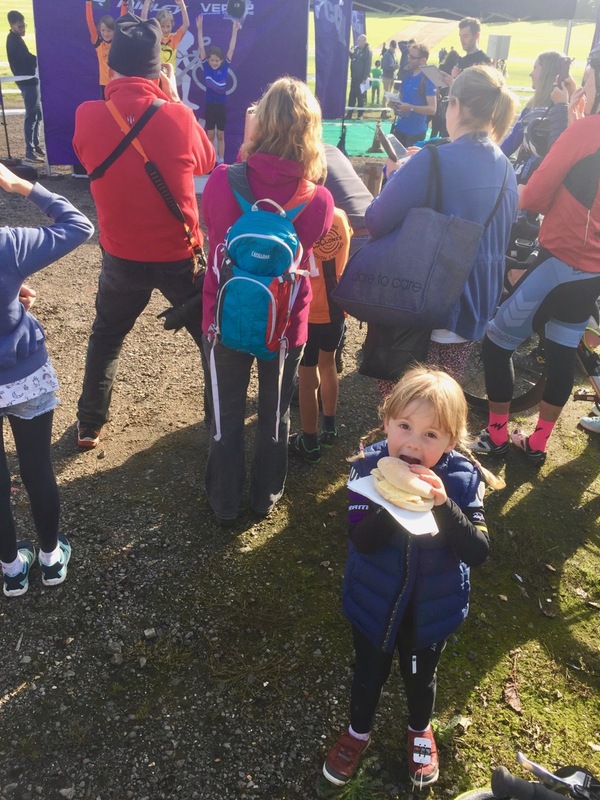 We are very grateful for the warm welcome (and cake!) 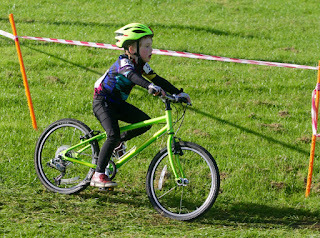 we all received at the MK Bowl, from the Central Cyclocross League. 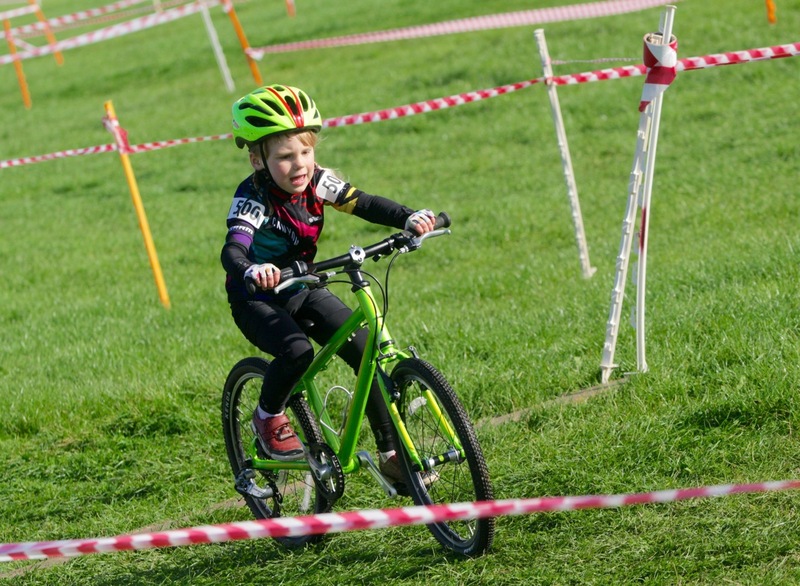 You can find out more about the Central Cyclocross League on their website, and if you're elsewhere in the country, try the British Cycling website for Cyclocross events listings near you. affordable health insurance plans njHi. Very interesting post. I discovered a product called Beldi Black Soap or just Beldi Soap. Would like to verify benefits with your help. Thnx.